This production opened on August 13, 2008 and closed on August 17, 2008. This was a wonderful tale of adventurous emperors, fire-breathing demons, and trickery beyond all reason. A perfect show that the whole family could enjoy! We began our performance with an exciting Persian Bazaar that started one hour before the show and continued during intermission with magical trinkets, flying carpets, fortune telling, wish granting, and photo opportunities galore! There were roaming bands of thieves and the chance to charm a snake or two! Our cast was very impressive and extensive. This was our largest cast to date! 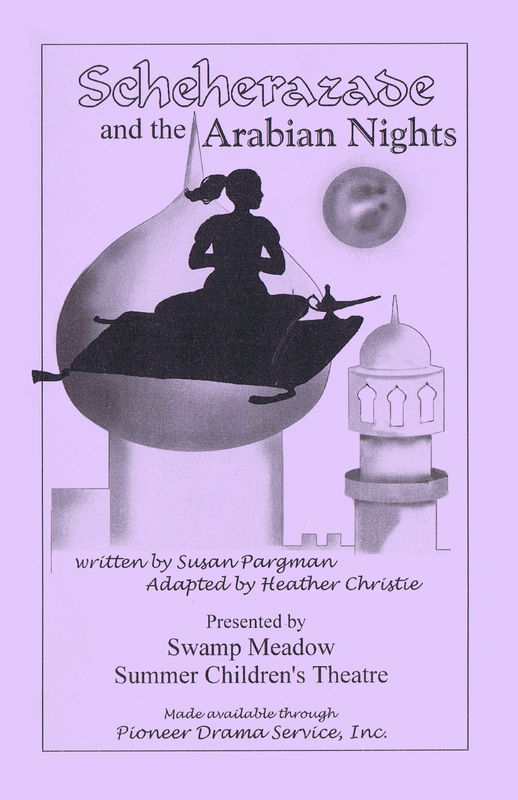 Scheherazade and the Arabian Nights had Emma Capron in the title role. In several other major roles were Kyle Inman, Madison Cook-Hines, Chase Lurgio, Christoper Mitrelis, Amelia Votta, and Hannah Blanchette. Rounding out the rest of the cast were Rebecca Green, Emily Carter, Mallory Cottam, Julia Arnold, Hayley Tartaglia, AnaCapri Mauro, Heidi Giguere, Abby Harris, Zachary Gibb, Connor Shea, Alex Cerullo, Isabella Giorgianni, Isaac Pontarelli, Brooke Fasano, Shane Inman, Austin DiMatteo, Brian Wold-Jensen, Dacia Cruz, Mary Arnold, Ruth Lear, Eryk Thoman-Thurber, Liz Kolakawski, Josh, Tirrell, Jillian Cerullo, Tess Safford, Aiden Lurgio, Emily Craig, Nathaniel Parenteau, Aydin Cruz, Connor Holden, Ben Batista, Alissa Harris, Katharynne Hebert, Ella Schwartz, Emily Cotta, Sarah Dimatteo, Evelyn Dubois, Sarah Alsfeld, Paige Kerkhoff, Amanda Parenteau, Allison Capron, Audrey Dubois, Christopher Hebert, Nathan Watts, Ryan Watts, Ian Torrey, Ethan Wurster, Zach Capron, Autumn McCann, Hannah McCann, Hannah Gibb, Emily Kiley, Stephanie Morissette, Ruby Nguyen, Madeline Shea, Ian Tait, Johsua Kerkhoff, Caleb Wurster, Tristan Arnold, Delaney Burke, Alexander Batista, Jake Farnum, Devlin Cook-Hines, Heather Fernandez, Kyla Duffey, Zachary Farnum, Nicholas Parentear, Emily Grande, Rowan Coleman, Olivia Huzzey, Cara Vieira, Jackie Smith, Haley Nunes, Kelsie Nunes, Emily Chretien, Michelle Chretien, Katie Kiley, Rosemary Paolucci and Leah Kiernan. The lead director was Heather Christie assisted by her directing team; Amanda Betchy, Kate Fantasia, Mariah Harington, Bob Hollis, Jake Wolf-Jensen and Samantha Pike, Dennis Chretien, and Ladelle Arnold. The producer for this production was Laura Giorgianni.